Childhood obesity is not only associated with adult obesity but also with increased risk of adult onset of type 2 diabetes and subsequent coronary heart disease. The potential effects of school-based health intervention programmes on cardiovascular risk and surrogate markers are unclear, as only few studies have attempted to investigate a complete risk profile including a detailed laboratory analysis or micro- and macrovascular function. In this study a comprehensive school-based randomized intervention programme will be investigated in 10-14-year old children addressing the influence of lifestyle intervention on inactivity, cardiometabolic risk factors and early signs of vascular disease. 15 secondary schools in Southern Germany are randomly assigned to intervention or control schools. Children in the fifth grade (10-11 years) will be observed over four years. The study combines a school-based with a home-based approach, aiming at children, teachers and parents. The main components are weekly lifestyle-lessons for children, taught by regular classroom teachers to increase physical activity in- and outside of school, to improve eating patterns at school and at home, to reduce media consumption and to amplify well-being. In 4-6 annual meetings, teachers receive information about health-related topics with worksheets for children and supporting equipment, accounting for school-specific needs and strategies. Parents' trainings are provided on a regular basis. All examinations are performed at the beginning and at the end of every school year. Anthropometry includes measurements of BMI, waist and upper arm circumferences, skinfold thickness as well as peripheral blood pressure. Blood sampling includes lipid parameters, insulin, glucose, hsCRP, adiponectin, and IL-6 as well as testosteron and estrogen to determine maturation status. Vascular function is non-invasively assessed by measuring arterial stiffness in large arteries using a sphygmograph and by analysing arteriolar and venular diameters in the retinal microcirculation using a non-mydriatric vessel analyser. A questionnaire is filled out to determine daily physical activity, motivational factors, dietary habits, quality of life (KINDL-R) and socio-economic data. Physical fitness is assessed by a six-item test battery. Our study aims to provide a feasible long-term intervention strategy to re-establish childhood health and to prevent obesity-related cardiovascular dysfunction in children. According to the World Health Organisation, cardiovascular disease (CVD) is the leading cause of mortality worldwide and is responsible for 30% of all global deaths . In adults, a high body mass index is the main reason for increased mortality . Adult and childhood overweight and obesity are often related to manifestation of metabolic diseases such as type 2 diabetes, hypertension and hyperlipidemia [3–6]. Overweight and obesity can often be tracked from childhood to adulthood [7, 8] and childhood obesity has been associated with premature death [9, 10] and adult coronary heart disease [11, 12]. The worldwide increase in obesity is related to changes in eating patterns and reduced physical activity. Caloric-dense foods with high satured fat and refined carbohydrates have replaced traditional diets with vegetables, fruits and whole grain products. The increase in fast-food restaurants  and "eating out" is associated with a higher risk to become overweight . Sugar-sweetened beverages induce weight gain and increase the incidence of type 2 diabetes . Unhealthy eating patterns are often combined with less physical activity. It is estimated that 60% of the population all over the world is inactive. Physical inactivity is estimated to be the main cause for approximately 21-25% of breast and colon cancers, 27% of diabetes and approximately 30% of the ischaemic heart disease burden . Physical inactivity and low physical fitness is associated with a higher risk for hypertension and stroke  and type 2 diabetes , independent of overweight and obesity. Results of the German Health Interview and Examination Survey for Children and Adolescents (KiGGS) have shown that only 28% of boys and 17% of girls reach the current recommendation of 60 minutes or more of physical activity each day (CDC 2010, WHO 2010). Low activity is particularly prevalent in girls, as well as in children with low socio-economic status or ethnic background . In the United States only 15% of the children go or bike to school (CDC 2010). In UK, the average annual walking distances has declined by 24% and the annual distance cycled by 31% from 1985 to 1995 in adolescents aged 15-19 years . These lifestyle changes lead to obesity, chronic diseases and premature mortality . The association between c-reactive protein (CRP) and future coronary events has been demonstrated for adults . CRP is a sensitive marker of inflammation and it plays a causal role in the process of inflammation . In healthy prepubertal children an association between CRP, fasting insulin, dyslipidemia, blood pressure and adiposity has been found . In the Cardiovascular Risk in Young Finns Study, high CRP levels were one of the determinants in youth for the incidence of adult metabolic syndrome . In obese and normal weight adolescents, regular aerobic exercise has been shown to reduce CRP concentrations [26, 27]. Also interleukin-6 (IL-6) plays a key role in the pathogenesis of CVD . It affects platelet reactivity as well as endothelial function . IL-6 is secreted to a large extend in adipocytes of visceral fat and is therefore elevated in obese individuals [30, 31]. In addition, IL-6 seems to be negatively associated with physical activity  and regular exercise has the potential to decrease IL-6 serum levels . The adiponectin, an adipokine, is reduced in obesity and type 2 diabetes. Low plasma adiponectin levels are a sign of decreased insulin sensitivity, adipocyte dysfunction and an important link to the development of vascular disease [33–35]. In children, adiponectin is also inversely correlated with BMI, fat mass and fasting insulin . The effects of physical activity on adiponectin levels in children, however, are still unclear. In summary, physical activity and physical fitness seem to be protective against low grade inflammation, but more longitudinal research is needed to clarify the association between physical activity, physical fitness, obesity and low grade inflammation in children . Physical inactivity has been shown to play a key role in the development of obesity-related atherosclerotic cardiovascular disease and may represent an important link between obesity, inflammation, insulin resistance and early atherosclerosis in adults . However, the association among children is less clear and has only been examined by a handful of studies . Increased carotid intima-media thickness (IMT) and impaired flow-mediated vasodilation (FMD) have previously been documented in young obese subjects which can be restored after a six-months exercise programme . Furthermore, in obese children, a higher arterial wall stiffness has previously been described . Pulse wave velocity (PWV) is a validated index of arterial stiffness which can easily be examined by non-invasive applanation tonometry. In healthy prepubescent children, increased PWV is associated with obesity and decreased cardiorespiratory fitness . The retinal microcirculation can be analysed non-invasively, which offers a unique opportunity to examine the effects of obesity on small brain vessels. In adults, obesity has been associated with a wider retinal venular diameter and a lower arterio-venous ratio (AVR). In several large adult cohort studies, AVR has been shown to be a valid index for an increased risk of hypertension, stroke and higher cardiovascular mortality [41, 42]. Similar to findings in adults, childhood obesity is associated with retinal venular dilatation and lower AVR , and higher childhood blood pressure has been linked to retinal arteriolar narrowing . The investigation of early macro- and microvascular impairments in childhood obesity are important measures to define obesity-related early signs of vascular disease. No study to date has examined the effects of a lifestyle intervention on the retinal microcirculation in children. Therefore, it is of great importance to elucidate whether early vascular alterations in children can be restored by a school-based intervention programme. Over the last twenty years, the amount of time children spend in front of television, computer and video games has increased and serious negative health effects such as violent behaviour, substance abuse (alcohol, smoking), decreased school performance, poor body image and obesity become more apparent . Television affects food consumption of children  and displaces physical activity . Reducing media use has been shown to be an effective measure in preventing obesity [48, 49] and improving educational achievements . Moreover, increased physical activity has been demonstrated to combine health benefits with reduced substance abuse . The school environment has great potentials to introduce and encourage a healthy lifestyle in children across all socio-economic and ethnic borders. However, it becomes more and more evident that the school-intervention approach needs to be combined with a family-based health education . Several lifestyle intervention programmes have been conducted in school settings, but the results have been inconsistent and have primarily focused on basic measures of obesity such as BMI or skinfold thickness [53–55]. Although anthropometric end points are fundamental, more attention needs to be drawn to obesity-related cardiovascular risk factors such as lipid profiles, adipocytokines, inflammation and insulin metabolism. Some more recent studies have demonstrated the beneficial effects of a school-based intervention on serum lipids and inflammatory markers in obese children . As childhood obesity is associated with signs of early atherosclerosis, school-based interventions should be validated with a long follow-up regarding improvement of behaviour (diet, exercise), body composition, fitness, and early cardiovascular risk profile. 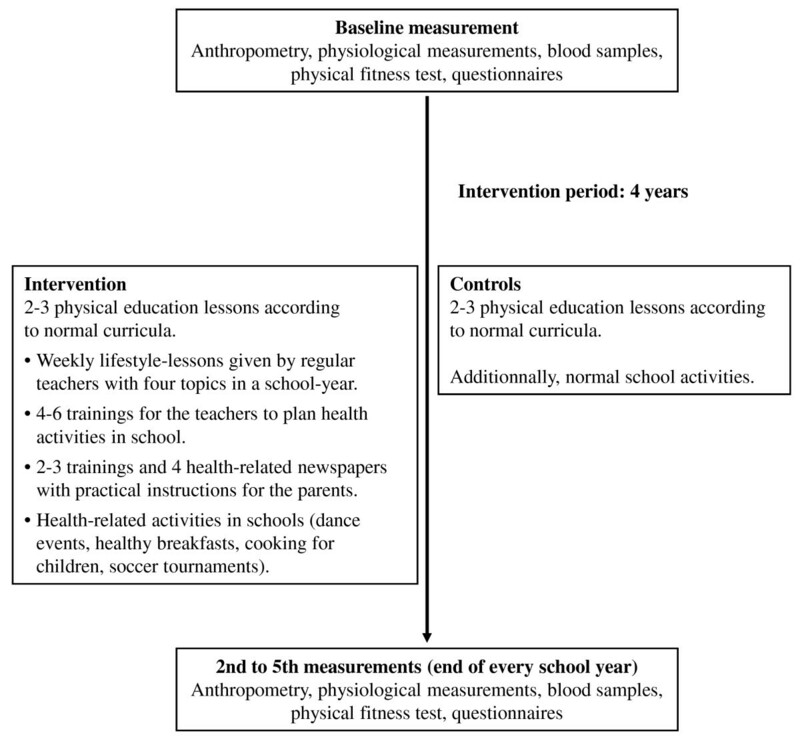 The study aims to implement a comprehensive randomized controlled school- and family-based lifestyle-intervention trial (RCT) in secondary schools to analyse and improve cardiometabolic risk factors and vascular function in large and small vessels of children aged 10 to 11 years over a period of four years by increasing physical activity and physical fitness, psychological well-being, and the motivation to exercise. Primary outcomes of the intervention were defined as an increase in number of days with physical activity >60 min/day (in- and outside of school). Prevention of early macro- and microvascular impairments (arterial stiffness and retinal vessel diameter). Reduction of cardiometabolic risk factors (Triglycerides, LDL-cholesterol, HDL-cholesterol, glucose, hsCRP, IL-6, adiponectin). Reduction of the prevalence of obesity (BMI, waist circumferences, total skinfold thickness). Improvement in motor abilities and physical fitness (six-item test battery). Normalisation in systolic and diastolic blood pressure. Increase in health-related quality of life (HRQoL) measured by a child questionnaire (KINDL-R). To analyse the correlation between arterial stiffness and retinal vessel diameter with childhood obesity and interventional improvements of cardiovascular risk factors. In addition, the association between arteriel stiffness, retinal vessel diameter and lifestyle factors (physical activity, eating patterns, smoking are elucidated. Figure 1 shows the flow diagram of the recruitment process. All secondary schools in the greater district of a city in Southern Germany were asked to take part by written invitations (65 schools), an advertisement in a local newspaper and via local radio announcements. Recruitment of participating schools was based on the willingness to take part over four years and to be randomized either to an intervention school with a lifestyle intervention programme or a control school. 12 urban schools agreed to take part in response to the individual invitations and interviews, 6 schools answered the advertisement in the newspaper. From these, 3 schools were excluded because they were located outside of the study area (distance >30 km). In all, 15 schools with 32 classes agreed to take part and were randomized. The children of 7 secondary general schools and 8 intermediate schools gave written consent from their parents. 12 schools are located in the city area and three schools are located in communities outside the greater city area. The study protocol was approved by the ethics board of the faculty of medicine of the Technische Universitaet Muenchen. The study takes into account the principles set out in the Helsinki declaration (Seoul, 2008) (2119/08). Fifteen schools with about 700 pupils attending fifth grade agreed to participate in the study and were randomly assigned to either intervention (n = 8 schools) or control group (n = 7 schools). Aim of the study is to increase the number of days per week a child is active, defined as days with physical activity of more than 60 minutes. This outcome is assessed in a standardized questionnaire at the beginning and at the end of the study. The primary analysis will be a comparison of the proportion of children with an increase in the number of active days per week between both study groups considering the effect of clustering. Due to the small number of cluster (n = 15) methods analysing the data on the individual level and accounting for the intracluster correlation (as e.g. GEE [57, 58]) or adjusted chi-square test  are not applicable . Therefore the primary endpoint will be analysed on the cluster level. 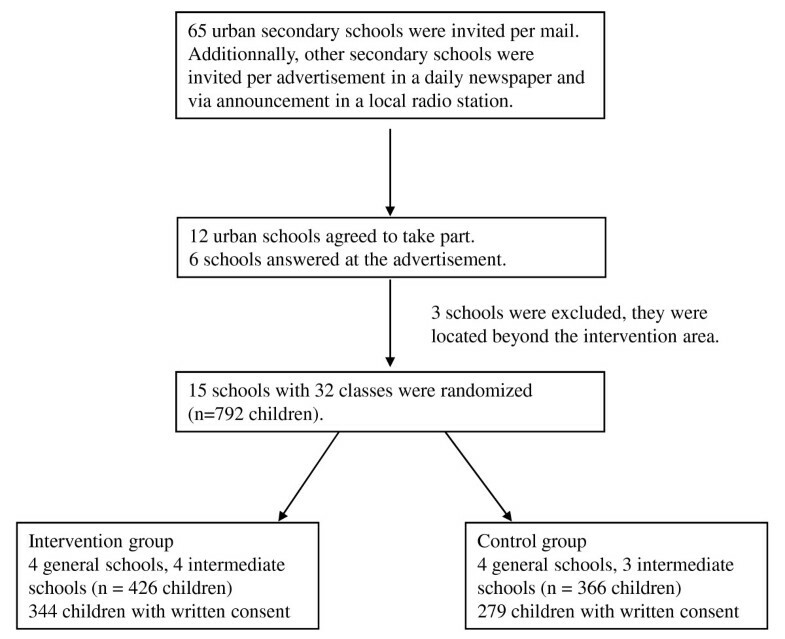 Mean proportions of children with increased activity assessed at school level will be compared between control and intervention schools as proposed by Donner and Klar  for the analysis of binary data in cluster randomized trials with a small number of clusters. A two-sample t-test will be performed to compare both groups. The t-test was shown to give valid results in such settings, even when assumptions (normality, equality of variances) are moderately violated . Since drop-outs of children will be mainly caused by school changes and therefore are assumed to be independent of the outcome, a complete case analysis will be performed to investigate the primary endpoint. Yearly examinations will be considered to investigate the pattern of missing values. If the assumption of random drop-outs does not hold, adequate imputation methods will be used. The primary analysis will be performed on a two-sided level of significance of α = 0.05. All secondary endpoints will be analysed on the cluster level. 95% confidence intervals will be presented for relevant measures. For binary data, means of school level proportions, for quantitative data means of school level means will be compared using two-sample t-tests. All secondary endpoints will be analysed in an explorative manner on a two-sided level of significance of α = 0.05, so no adjustment for multiple comparisons will be conducted. In a similar trial in younger children (JUVENTUM I, currently under review) a standard deviation for the school level proportion of children increasing their activity of 9 percentage points was observed in both groups. Assuming this standard deviation, the study is sufficiently powered (over 80%) to detect a difference between control and intervention group of 15 percentage points, translating to an effect size of 1.67, on a two-sided level of significance of α = 0.05. This lifestyle intervention programme aims to increase physical activity in schools and at home by the following means: regular physical exercise in sports lessons, additional school-based exercise such as active breaks during regular lessons and active school breaks, improving playing facilities at school, increasing sports activities at home. Furthermore, the programme intends to improve eating patterns (less sweetened drinks, regular healthy breakfast, healthy meals at school, daily fruits and vegetables), to reduce media use, to prevent substance abuse and to improve well-being. This comprehensive prevention programme was planned according to the social cognitive theory  with the following components: information for children and teachers about health risks and benefits of different lifestyle habits in lifestyle-lessons, regular information and lessons for parents, little extra homework and tasks to encourage social and self-management skills, enable all participants to translate the knowledge and skills into effective preventive practices, strengthen children as well as teachers to control difficulties and setbacks in regular discussions, create social supports for individual health behaviour changes (structural changes, development of a "healthy school"). Children obtain weekly health education lessons from their regular teachers to increase physical activity in and outside of school and to improve the health behaviour (healthy food, no drugs) as well as the general well-being of children. Each topic will be discussed over a period to 4-6 weeks. Children receive worksheets, specific homework or practical instructions to transfer the healthy lifestyle in daily activities. The teachers will be trained regularly in 4-6 annual meetings to perform the lifestyle-lessons with their pupils. The contents of the lifestyle-lessons are explained and discussed and additional activities in schools are planned (arrangements in classrooms and playgrounds, implementation of healthy meals at school, healthy lifestyle for teachers and other employees at school). Parents will be informed about the programme and the health-related topics of the lifestyle-lessons by regular newspapers (4x/year). They are invited to trainings (2-3x/year), which include cooking with their children, media use and hands-on-sessions for a more active lifestyle in the family. Schools' health-related practices are analysed and included in the approach of the intervention. Control schools are asked to continue their usual school curriculum (Figure 2). Content and Timetable of Intervention. All measurements and fitness tests are performed on a yearly basis in every school over a period of four years (Table 1). The examinations are to be carried out individually by trained staff according to standardized operating procedures during classroom lessons in three separated rooms inside the schools. The physical fitness tests are conducted by trained staff in the physical exercise lessons in the sports halls on a second examination day. The questionnaires are filled out in class. Both children and parents are informed (in German and Turkish) that they may withdraw from the programme at any point and that all information collected is confidential. Only data from children with written consent is included in the anonymous data analysis. Teachers, children and parents are informed about their programme status and will be aware if they are in an intervention or control school. All clinical examinations are conducted by trained medical staff according to standardized procedures. Height and weight are measured at the beginning of the programme and annually at the end of a school year with minimal clothing without shoes. Weight is measured to the nearest 0.1 kg by using a calibrated balance scale. Height is measured to the nearest 0.1 cm by a rigid stadiometer. Body mass index (BMI) may then be calculated as weight in kilogramms divided by the square of height in meters. The BMI-SDS (BMI-standard deviation score) is determined using the LMS-method . Reference data from German children are used . Children with a BMI lower than the 10th percentile are classified as underweight, between the 10th to 90th percentile as normal, between the 90th and 97th percentile as overweight, and above the 97th percentile as obese. The pubertal development stage is being determined by estrogen and testosteron levels. Waist circumference is measured on bare skin in a standing relaxed position in a horizontal line just above the navel, the upper arm circumference is examined half way between the olecranon process of the ulna and the acromion process of the scapula with a non-stretchable tape measure. Skinfold thickness as a surrogate of subcutaneous fat is measured at four sites (m. bizeps, m. triceps, subscapular and supra-iliacal) according to the guidelines of the manufacturer. Blood pressure is measured by using a validated protocol  at the right brachial artery in the fossa cubitalis after the subjects rest for 5 min in a supine position. Measures of systolic and diastolic blood pressures and the cuff sizes are to be recorded. Blood sampling is performed in fasting status. Blood samples are taken by venipuncture of an antecubital vein in either sitting or lying position after an overnight fast, using vacuum tubes. Blood samples are collected by qualified medical staff. Breakfast is to be provided after blood sampling to all children in the classroom. Blood samples will immediately be transported to the laboratory to be analysed. Samples will be analysed for triglyzerides, LDL- and HDL-cholesterol, fasting glucose, insulin, adiponectin, IL-6, hsCRP (high sensitive CRP), testosteron and estrogen, respectively. Arterial stiffness in children is assessed by use of a sphygmograph (SphygmoCor SCOR-Px, AtCor Medical Pty. Ltd., Sydney Australia) following a standardized protocol validated in adults to detect early macrovascular changes. The system uses an applanation tonometry device connected to an electronic module to non-invasively record and analyse pulse wave forms of the radial artery in children after 5 minutes of rest in a lying position. From these measurements, the calibrated ascending aortic blood pressure waveforms can be estimated. Accordingly, central systolic and diastolic blood pressure, pulse pressure, augmentation pressure and the augmentation index (AiX@HR75) are computed as described elsewhere . For each measurement, an average of ten pulse waves is taken to calculate the above parameters. For each child at least two valid, quality-controlled measurements (operator index ≥75%) are recorded and averaged. The diameters of retinal arterioles and venules are measured using a Static Retinal Vessel Analyser (SVA-T, Imedos Systems UG, Jena, Germany) to detect early microvascular changes. The system allows non-invasive online measurement of the diameter of retinal vessels without mydriasis. It consists of a fundus camera and an advanced image processing unit . For static analysis, two valid images are taken from the retina of the right eye with the optic disc in the center. Retinal arterioles and venules are identified using special analysing software identifying retinal vessels in ring-zones (Vesselmap 2, Visualis, Imedos Systems UG). All retinal arterioles and venules are differentiated by the examiner in the outer ring zone and measured by the automated software. Diameters are calculated to central retinal arteriolar and venular equivalents (CRAE, CRVE), using the Parr-Hubbard formula described elsewhere . The CRAE and CRVE are used to calculate the arteriolar-to-venular ratio (AVR), taking the mean of both measurements. Physical fitness is measured by the Munich fitness test. This standardized test includes 6 items (step test, goal throwing, stand-and-reach, jump-and-reach, flexed arm hanging, ball bouncing) designed to evaluate cardiopulmonary fitness, coordination, muscle strength, and flexibility in children. For each item, participants receive gender- and age-specific t-scores between 30 and 70 points. The sum of the 6 items divided by the number of items yields the total t-score . Standardized questionnaires were used to obtain demographic variables (native country and nationality of the parents and children, first language, school duration, graduation and working position of the parents, number of family members). Physical activity is measured by a validated questionnaire concerning the amount of moderate-to-vigorous physical activity . Further items are duration, intensity, and frequency in leisure time, school and sports clubs activities as well as motivation to be physically active . Additionnally, the amount of physical activities of parents, siblings, and peers is asked. For the assessment of dietary intake, a food frequency recall is used according to a questionnaire which was used recently in a large german survey . The quality of life is determined by the 24-item 5-point Likert scale KINDL-R-questionnaire  with subscales for physical well-being, emotional well-being, self-esteem, family, friends, and everyday functioning. Additionnally, smoking patterns and the consumption of alcohol are asked. At the end of every school year the teachers document the number and contents of the lifestyle-lessons as well as all other health-related activities at school. Additionnally, topics for the next school year may be proposed. Previous reviews on school-based childhood obesity prevention programmes have so far been unable to show clear evidence for the efficacy of intervention programmes, limited by the small number of published studies and by methodological concerns . Most interventions did not improve BMI. But it is known that physical activity can increase lean muscle mass and decrease fat mass with no changes in BMI . Additionally, physical activity has direct effects on metabolic function and cardiovascular risks . Relevant health effects such as normalisation of lipid profiles and inflammatory markers or, most importantly, improvements of vascular end organ damage are not detected focusing on anthropometric parameters only. In our study, we aim to implement an integrated approach by combining the analysis of anthropometric data with cardiometabolic risk factors and measures of vascular function. Our objectives are to thereby detect children with increased cardiovascular risk and signs of early vascular impairments. We further aim to demonstrate that the comprehensive school-based intervention programme has the potential to restore vascular changes in obese children. Pulse wave and retinal vessel analysis are key elements of the study design and both are non-invasively applicable in children. They help to visualize and communicate direct health benefits of the longitudinal intervention to participating children, parents and teachers. Numerous investigations have demonstrated a decrease in physical activity and physical fitness in children. The school environment can play an important role in increasing the physical activity of children. The way to school is an important part of daily activity and facilitates children to reach the current recommendations . Therefore, active commuting should be supported by schools and parents. An increasing number of children in Germany spend the whole day at school. Schools should therefore aim to offer physical activity practice in regular lessons, to carry out sufficient physical exercise lessons with qualified teachers, as well as to provide sufficient physical activity proposals during breaks and in the afternoon. Beyond these school-based efforts, the prevention programme will encourage family-based physical activities and reinforce the cooperation between schools and sports clubs. In addition, the programme educates children and parents on healthy food and eating patterns in order to improve their skills to achieve a healthy lifestyle. Advice is given to the schools' administrations to implement healthy food in school vending machines and school meals. Over the last decade, the growing influence of internet and social networks as well as the increase of media use has augmented enormously, especially in children. School-based prevention programmes therefore need to include media-competence-training to prevent a further decline in physical activity, negative effects on school performance or well-being. This health-promoting prevention programme is based on the following components: information for children, teachers and parents about important health-related topics, encouragement to translate knowledge and skills into daily practice, discuss difficulties and setbacks that arise in everyday life. The programme aims to target and improve the personal responsibility of the children, strengthened by the healthy attitudes of teachers and parents likewise. The comprehension of personal responsibilities is an important focus of the programme. In school children, puberty represents a point of time where unhealthy lifestyle often originates (smoking, alcohol abuse, excessive media use, inactivity, psycho-social difficulties). Participating schools will be provided with worksheets for the children and health-related information for their parents, in order to facilitate the transfer from school to family routine. Weekly lifestyle-lessons over a period of four years aim to ensure sustainable health effects. Our study has some limitations. First, all children, parents and teachers needed to be informed about the group allocation. The main coordinator of the study is also not blinded to the group assignments of the schools. However, the medical examiners are not aware of the group allocation of the participating children. This programme is conducted in 15 secondary schools and all assessments need to be integrated in the daily routine of the schools. On the basis of the number of participants at baseline (n = 792), physical activity can only be measured by questionnaire and not by accelerometers. Also, eating patterns are assessed by a food frequency questionnaire and not by weighed dietary records, which do not seem to be applicable to daily school routine. The main strength of the study approach is the assessment of macro- and microvascular changes as an early functional marker of an increased cardiovascular risk in children with different body composition and levels of activity. In fact, this is the first school-based intervention study to include this integrative approach. The results of this study may help bridge the pathophysiological gap between childhood obesity and the reported associated increased risk of adult coronary heart disease and premature death [9, 11, 12, 44]. We hypothesize that our intervention can easily be integrated in the daily routine of schools and that it proves to be an effective means to increase the physical activity levels of children in school and at home. We expect activity- and lifestyle-induced improvements of lipid profiles, low grade inflammation and metabolic risk factors as well as the normalisation of vascular impairments in children at risk. If the expected health benefits can be confirmed during the course of the programme, this interventional setting may have the potential to act as a model for future interventions and to emphasize the importance of detecting early vascular changes in children. Vascular end points may proof to be better predictors for the success of early life style interventions on childhood and future adult health. Henner Hanssen contributed equally to this work. This work has been funded by a grant from the Bavarian State Ministry of the Environment and Public Health (Gesund.Leben.Bayern) (LP 00001-FA 08). MS, HH and MH designed and wrote the original proposal. CL and BH were responsible for analysing and interpreting data. All authors have read and approved the final manuscript.